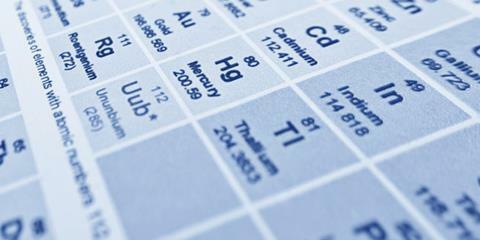 Update – On November 30 2016, Iupac confirmed the naming of the new elements: nihonium, moscovium, tennessine and oganesson. To find out more about how these elements are made, and see our interview with Yuri Oganessian, after whom element 118 is named, read our feature on what it takes to make a new element. How do scientists pick the names for new elements? Element 113 – currently known by its placeholder name ununtrium – is the first to be discovered in east Asia. It was created by Kosuke Morita’s group at the RIKEN Nishina Center for Accelerator-based Science in Japan, by firing a beam of zinc-70 at a target made of bismuth-209. The group first claimed to have created the element in 2004, but there was still some uncertainty at that time because of the instability of one of its decay products. They followed up these experiments with more convincing evidence in 2012. Elements 115 (ununpentium) and 117 (ununseptium) were discovered by groups collaborating across three institutions – Lawrence Livermore National Laboratory in the US, the Joint Institute for Nuclear Research in Russia and Oak Ridge National Laboratory in the US. The Lawrence Livermore-Joint Institute for Nuclear Research collaboration is also credited with having fulfilled the criteria for discovering element 118 (ununoctium) in work published in 2006. Now that the elements have been officially discovered, the institutions responsible will get to choose permanent names for them. But it will be a while before the textbooks and posters can be updated, as the new names and symbols will have to be approved by the inorganic chemistry division of Iupac and submitted for public review. Various rules govern the names that can be given to new elements, which can be inspired by nature, mythology, people, properties or places. ‘The symbol is particularly important,’ says Soby. ‘They have to go through all the archives to check if it has ever been used before. It has to be unique.’ She adds that the timing is hard to predict, but estimates the process will take between four and six months. As a non chemist who is greatly interested in chemistry this is a great way to keep informed. My main interest is the chemistry of radioactive compounds and their uses. In my Chemistry class, we were on a field trip where we were informed that people were trying to find combinations of metals to make things like solar panels work more efficiently, as with the metals currently used, though common, are not as good as rarer metals, like Yttrium. So, I was wondering if this process has been used to try to create preexisting elements, like Yttrium. If it hasn't, then could it be tried sometime? I figured maybe these elements weren't stabilizing properly because they simply aren't supposed to exist, so maybe elements that are naturally stable would work. If anyone can use any of this, then great. If not, sorry for wasting your time if you read all of this.